Lionel Messi is the overwhelming choice of World Soccer’s readers as our World Player of the Year. The brilliant Barcelona and Argentina attacker collected more than 60 per cent of the votes cast in our annual poll – a record in the 30-year history of our awards. The previous highest percentage was for Michel Platini, who garnered 54 per cent of the votes in 1984. 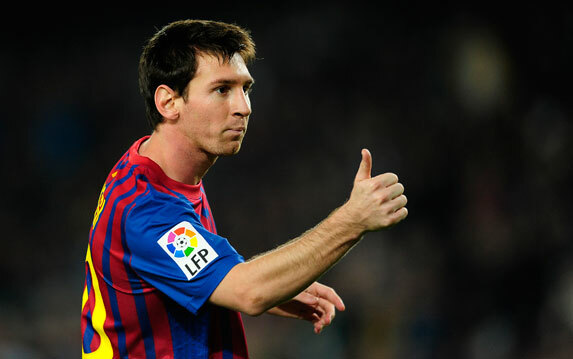 It is the second time Messi has topped the World Soccer poll. He was the victor in 2009, but lost out to his Barca team-mate Xavi last year. Xavi finished third this time, behind Cristiano Ronaldo of Real Madrid and Portugal. There were three Barcelona players in the top 10 – Messi, Xavi and Andres Iniesta – while five of the top 10 play their football in Spain’s La Liga. Brazilian starlet Neymar is the only player in the top 10 based outside of Europe. The Santos youngster finished sixth in the World Player poll, but was the clear winner of the Young Player award, ahead of Borussia Dortmund midfielder Mario Gotze, Lille’s Belgian attacker Eden Hazard and Barcelona midfielder Thiago Alcantara. Barcelona pretty well cleaned up, winning the World Team award and with coach Pep Guardiola chosen as World Manager of the Year. Both of these victories were at the expense of Uruguay, whose coach Oscar Tabarez ran Guardiola close in the managerial vote. Last year’s Manager of the Year Jose Mourinho finished a distant fifth in the award, ahead of his successor at both Porto and Chelsea, Andre Villas-Boas, who was sixth. Manchester United manager Alex Ferguson, a three-times winner of the World Manager of the Year award, was third. Votes were cast from more than 40 countries, including Canada, New Zealand and Turkey, to once again demonstrate the global nature of the World Soccer awards.